That’s what I think he’s asking me, as I stood there and took pictures of him. His name is Gucci, he’s 30 years old, and he’s a hyacinth macaw. He lives in an exotic bird store that we passed by on our drive to the soccer game last weekend. 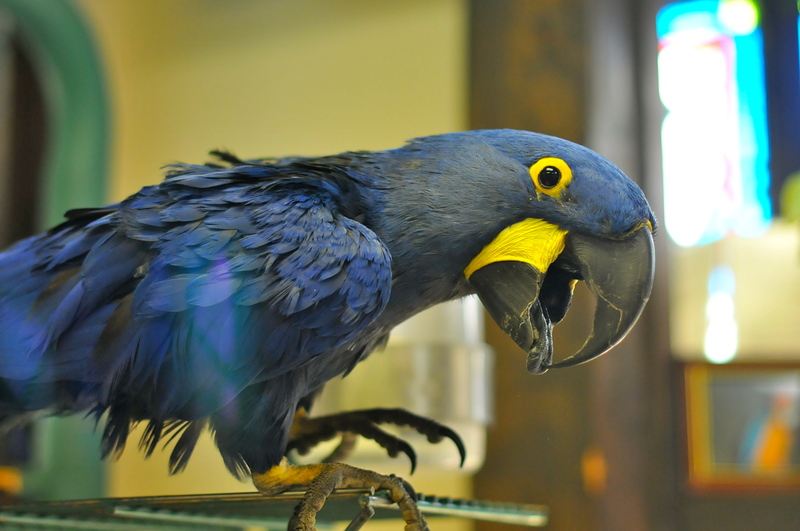 My husband is the bird lover – he had a blue and gold macaw and an orange-naped Amazon back home. Plus countless other birds, big and small. So we had to stop and take a look inside. There were other birds in the store, but they were inside cages. I tried to take pictures of them, but they didn’t come out too good. Gucci was the only one outside on a perch, so even though he didn’t sit still long enough, I still got some decent shots of him. Out of all the birds that my husband has introduced me to, this is my favorite. I just love that deep blue-almost purple color. He’s a pretty bird, isn’t he. Beautiful bird and wow that’s a lot of yrs, nice post!!! Thanks. They can live up to 70 years, so he’s got some years to go yet. My husband and I both love birds! This is a beauty! Yes, he is. We have an African Grey here at home – the only left after a zoo of sun conures, canaries, cockatiels. OOH, I bet he/she talks? They are supposed to be quick learners.